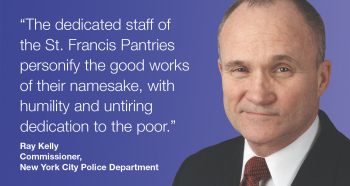 Spring was eagerly celebrated by St. Francis Food Pantries and Shelters with many fresh ways to help over 10,000 poor families in the New York area. Macy's "Bag Hunger 2012 Campaign" led by R. B. Harrison, Mitch Leventhal, Margaret Grioli and Agnes Zakrzewska provided overwhelming support to St. Francis Food Pantries and Shelters. Their "Partners in Time" volunteers held creative fundraising projects to raise money for our mission to help the poor. In addition, seven Peanut Butter & Jelly Sandwich Days were held by hundreds of their volunteers - and over 15,000 sandwiches were added to our "Brown Bag Feeding Program". Macy's also sponsored our "St Patrick's Day Luncheon" for over 500 clients from our Food Pantries at the Affinia Manhattan Hotel in Midtown. A traditional St. Patrick's Day meal of corned beef and cabbage was served by Macy's volunteers, who also made balloon sculptures and painted faces for the children. A magician entertained everyone, and a lucky Leprechaun visited with the guests and distributed bags of "gold" candy. Ross Stores continued to donate hundreds of new home goods and clothing items to help our clients prepare for the new season. Abigail Garcia, Operations Supervisor coordinated the deliveries. 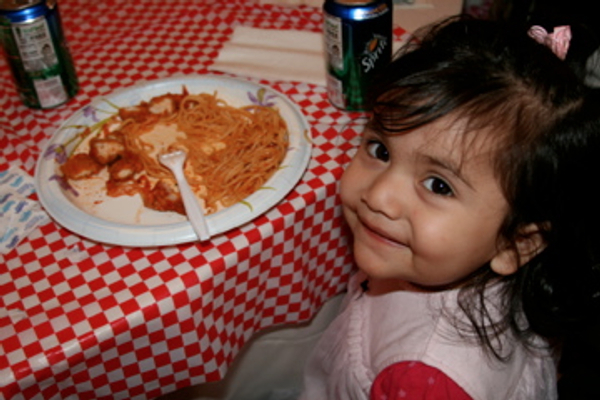 "Spring Luncheons" provided special meals at many of our Shelters and Drop In Centers. St. Francis Food Pantries and Shelters also helped provide Easter Baskets for the children attending one of these Luncheons at a Women's and Children's Safe Haven in New Jersey. The Ralph Lauren Foundation hosted a Peanut Butter & Jelly Sandwich Day in conjunction with their Spring Volunteerism Awareness Week. Over 100 of their volunteers made more than 4,500 sandwiches which were distributed to four feeding programs we help. Our annual "Pasta Party" was served to over 500 needy families at the Affinia Manhattan Hotel. Con Edison Presented the event and Macy's was the Food Sponsor. Volunteers from both companies served a tasty meal with an Italian flair. A "Cinco de Mayo Dinner" was held for more than 400 clients at our Soup Kitchen in New Rochelle. The dinner was a lively event enjoyed by everyone in attendance. Parties and luncheons for Mother's and Father's Appreciation Day were held at many of our Food Pantry locations as a special recognition for these important clients who are also family leaders. So much help and care is provided directly to the less fortunate New Yorkers in our network by the volunteers and corporations in our "Family of Supporters". St. Francis Food Pantries and Shelters appreciates all of these efforts - and offers a heartfelt thank you to everyone involved.